I know my previously-loyal readers (all three of them) were disappointed to see my 2010 posts trail off last April. The explanation for this was lack of both garden and blog time due to a bathroom remodel and the rigorous training schedule of a triathlon. 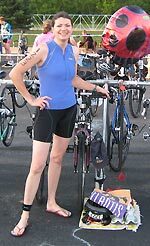 I’m happy to say I completed my first-ever sprint-length triathlon on July 11, 2010. The bathroom remodel was pretty much finished by October, but with all DIY projects, there are still a few finishing touches remaining. I’m currently in the process of back-filling entries for 2010. I apologize for the delay, and hope to stay more on top of things this year.